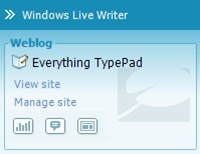 Support for TypePad Pages -- Now you can create and edit TypePad Pages directly in Windows Live Writer. This is great news for those of you (and us!) who like to work offline while traveling, or anywhere else where Internet access may be hard to come by. Table Editing -- Insert and edit tables in your pages and posts. Perfect for when you need to present columns of information. Support for Categories, Excerpts and Extended Entries -- Now you can set all of this information directly in Windows Live Writer. Say good-bye to the days of clicking "publish" in Windows Live Writer, then clicking over to TypePad to add that information separately. You can read more about Windows Live Writer and download it (did we mention that it's free!) on the Windows Live Writer blog. TypeLists allow you to add almost anything to your blog sidebar, and TypeLists are easy to update with both Basic and Advanced templates. Notes TypeLists give you flexibilty to add text, HTML, and images to your sidebar. You can set up a drop-down menu for your Archives or include a short disclaimer by entering text. The Pages sidebar module is an easy way to add links to the new Pages you have created for your blog. But with a Notes TypeList, you can add more pizazz by creating a series of linked images pointing to your Pages. 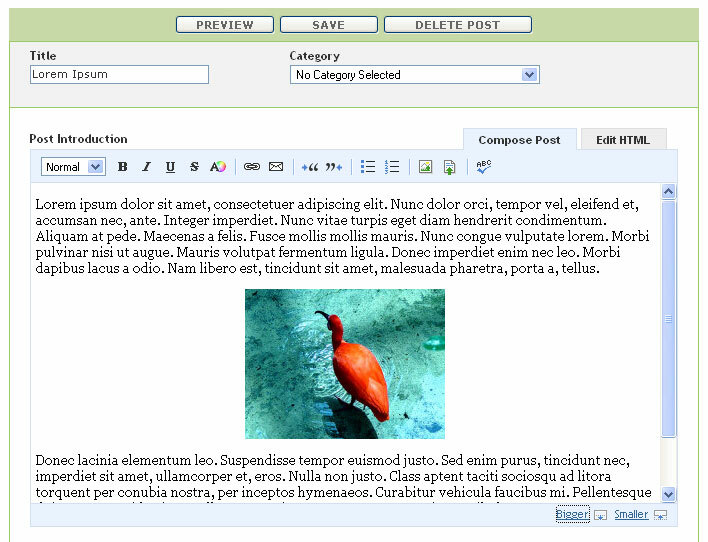 The alt and title attributes can be edited to include the Title of the page linked through the image. This text will pop up when hovering your mouse over the image. Replace "http://example.typepad.com/my_weblog/page1.html" from the example with the URL for the Page you want the image to link to. When creating or editing a Page, you can set the Filename for the Page. The full URL for the page is this Filename added to the end of your blog's URL and this is what you'll use in the code. Additional information on adding linked images to your sidebar with a Notes TypeList is available in the Knowledge Base. If you're an Advanced Template user, you can take advantage of this too. Although you can add HTML for links and widgets directly to a sidebar template using Advanced Templates, using a TypeList is usually better. The advantage to using TypeLists is the ease with which you can update the items in the list. 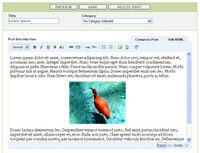 There is no need to edit your templates each time you add a new link to a blogroll, for example. The new item can be added directly from the TypeLists tab by clicking the Add an item button. TypeLists are included in your templates with a MTListInclude tag, or you can have more control over the TypeList within your templates by using the MTList tags. See the TypeList Tags article for more information. After placing TypeList tags in your sidebar template, the list will update automatically when you add a new item or edit an existing item. Weekly polls, blogrolls, and any other sidebar content you will be editing frequently are good items to place on your blog with a TypeList, instead of editing the sidebar template directly. Some fun news for a Friday! We just got word that the editors at Webware.com selected TypePad as a finalist for the Webware 100 Awards. The Webware 100 celebrates the web’s 100 best services, as selected by users like you. So, if you’re a TypePad fan, be sure to vote for us in the Publishing category. Verifying Your Site with Google. Don't forget to subscribe to the Knowledge Base Update Feed so you can get new and updated articles right in your feed reader! If you're a TypePad blogger, we know you're serious about making a great blog. But what about the parts of your site that don't fit into your blog? A detailed contact page listing all the ways someone can get in touch. What about a biography that explains just how you became such an expert on the topic you blog about? 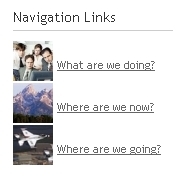 Or, maybe your business's blog needs a good set of directions to your office, along with a map. A couple extra pages on your site would add a lot of power and flexibility to your blog. With the new TypePad Pages, you can use all the power of TypePad's posting tools to create as many individual web pages as you want. And those pages have all the power of TypePad's widgets and rich media features, automatically inheriting the look and feel you've chosen for your blog. The TypePad interface you use every day to update your blog now lets you create a web page as easily as you’d write a post. (That means you don't have to learn any complicated new tools.) And you can even set a Page to be the home page for your blog, so it’s the first thing readers see when they go to your URL. Of course, you don’t have to build a full website to take advantage of TypePad Pages. You could just create a Page with detailed contact info and add a link to it in your blog’s sidebar to make it easy for your readers to know how to connect with you. Or, if you have multiple authors, you could create a bio Page for each of them to help your readers learn more about the people behind the posts. This feature is available at all account levels, to all TypePad members. 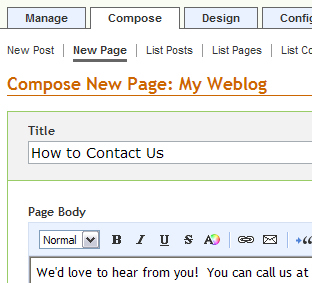 To create a Page, go to Compose > Page and add Page content (text, images, video, etc...) just as you would a post. When you want to update a Page, simply open it from the List Pages tab and edit and save it as you would a post. Whether you use Pages to build out a full website, or simply to augment your blog, we can't wait to see all the creative ways you’ll use this feature. And as always, send us your feedback on ways we can make it better! When we browse your blogs and read your feedback, we’re constantly impressed with the neat tricks and tips for using TypePad you’ve discovered and developed. Now we want to give you the chance to share those tips with other TypePad members! Whether it’s a tip about how you brought new readers to your blog, how you use a third party service to enhance your blog’s content, or any other way you’ve found to make your TypePad blog better, we want to hear it. So leave your tips in the comments. We'll feature great tips here on the blog and in our monthly email newsletter. (Yes, we still do email! Are you subscribed?) Oh, and there's a bribe! If we feature your tip we'll spotlight your blog alongside it, and send you one of our limited edition, ultra-stylish, not-available-in-stores TypePad t-shirts. What could be better than that? As bloggers ourselves, we know the thrill that comes with learning that new readers have found our blogs. So, we’re very excited to tell you about a new feature that can help new readers discover just what your site's about -- editable meta tags. As described in this Knowledge Base article, meta tags are bits of text that live in the HTML code of your blog. Meta tags are not visible to a person viewing the page in their browser, but many search engines use this information when listing websites in search results. Meta tags come in two flavors: Keywords and a Description. 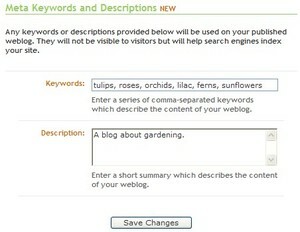 Keywords are a list of words that relate to the content of your blog. If you write a gardening blog, your might use words like “tulips” “roses” and “orchids” to help readers looking for information on those flowers find your site. The Description is a short summary of the content of your weblog. So, you might write “a blog about gardening” to describe your gardening blog. To add meta tags to your blog, go to Weblogs > Configure > Publicity and fill in the Keywords and Description fields in the Meta Keywords and Descriptions area. 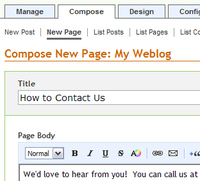 After saving your changes and republishing your weblog, your meta tags are automatically inserted in your weblog. You can modify the Keywords and Description fields at any time to update your meta tags. Tell Google about your blog! Google Sitemaps are simple text files that describe – in a language Google’s computers understand – the pages on your site, what they're about, and how often they change. 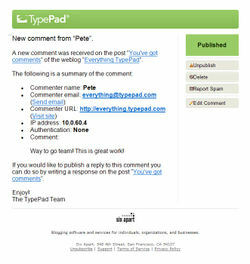 And now TypePad can create and publish one for your site automatically. If you're using one of our pre-defined themes, or have customized your own with our point-and-click tools, you can automatically publish a Sitemap by visiting the Publicity page on the Configure tab of your weblog, selecting “On” in the Google Sitemap section, saving that change and republishing your blog. If you're using Advanced Templates, you can create your own index template with a Google Sitemap based by simply following the instructions and copying-and-pasting the handy code we've provided in this Knowledge Base Article. From then on, every time you update your blog, your Sitemap is updated along with it. To make sure that Google knows about it, though, you should register for an account at the Google Webmaster Tools site, and give them your sitemap URL (you'll find it on the Publicity page). You can read more about how Google uses Sitemaps, and how you can submit yours to them in this article in the Google Help Center. The old adage "a picture is worth a thousand words" is especially true in blogging. For this reason, TypePad makes it easy to add images to your account in many different ways. Photo Albums can be created at all levels of TypePad and are a great way to upload and manage a collection of images. You can upload images in batches via the Photo Album Upload page, or use a zip file to upload multiple images at once. If you're a Windows XP user, you can download and install a wizard for the Windows XP File Explorer to easily upload images to your Photo Album, right from your computer folders. Then, you can choose to display all or just a few of your Photo Albums on your weblog's sidebar so that your readers can easily access them. You can easily add images directly into your posts using the Insert Image button, and there are many ways to style and align your images in a post. 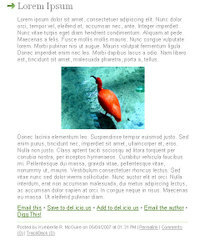 If you post many images from your camera phone or mobile device (we recommend using TypePad Mobile for this if you have a compatible device), or if you want to feature your posted images, you may want to choose from one of our Mixed Media layouts - which are designed to highlight images uploaded into posts. Additionally, you can add images to your sidebar (including third-party scripts like Slide.com slideshows and Flickr badges) using a Notes TypeList. 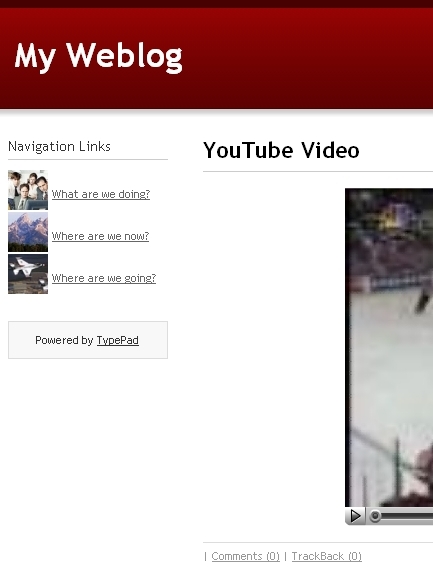 Be sure to also check out our photo and video widgets for more easy ways to display images in your sidebar. And we didn't stop at the email notification. Once you click through on those notifications, you'll discover a redesigned comment viewing and editing screen. The little menu options that fly out when you point at items now make it easier to act on comments or TrackBacks right from within the listing screens. One of the big reasons we've made these usability tweaks is to improve TypePad's spam filtering tools. You'll probably notice a big, prominent "Report as Spam" button; We've had this functionality in TypePad for over a year, but we haven't always made it easy for you to get to until now. So if you think a comment or a TrackBack is coming from a spammer, use that "Report as Spam" link and you'll be helping our community's filtering tools can get better, faster and smarter.